When I go to an almost week long conference later in the month I will not be taking a laptop, I’ll be taking this iPad and a blue tooth keyboard with me. it is just a bit iPod Touch… but in this case size does matter; that along with a 10 hour battery life. The larger screen and longer battery life turns it into a much different device than an iPod touch. Reading: In my opinion a great reading device. Kindle App syncs accross all devices tied to my account, so I can start reading on my iPad, switch to my iPhone, and continue on a Kindle device and it keeps me “book mark” between all the devices. Allows people to set the font size to something comfortable – Huge feature as time goes on. Simple Research: Excellent for simple research. If you’re looking for an answer that requires looking up just a website or two then this is just as good a tool as a computer. For more complex searches, where you have to reference, copy and paste multiple blocks of text, the a laptop or computer will be better (at this point in time – this may get easier with a software update expected out soon). One drawback is that if you use the NYTimes app for reading the news, you can’t copy and paste text from inside the app… you can email the article to yourself and then do it from there… Why to the content providers continue to shoot themselves in the feet? Meetings: less intrusive laying flat than the vertical screen of a laptop. Drawing: Adobe Ideas. Fun, free, layer based drawing program. The Elements: This is what I needed to get me interested in Chemistry. Kyak Flights: Easiest way to look for the right flight. My oldest son just turned 15. We purchased him a cell phone for his birthday, and on it’s first day of use he received 100 text messages. He advertised his new phone number on Facebook, and literally within minutes his new phone was buzzing with text messages. He has not used his cell phone once in the past week to talk to friends… just text. He and his 4 siblings have email accounts, but do not use them… They just text messages and use Facebook for communication with friends. Reqall – A personal Reminder system – Transcribes your voice to text. Emails what you’ve said to you, and add text to your “to do” list & sends a copy to your email address. If you’re on the go, this is a great way to remember something. The iPhone app is location aware, so if you’ve added items to your grocery list, when you open it at your predefined grocery store, the GPS tell is your at the store, and displays the items you need to pickup there. This is a great personal productivity app? 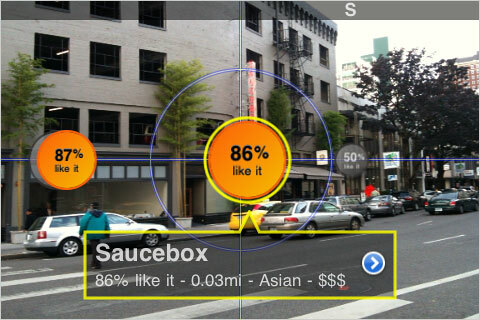 Urban Spoon – An example of a location aware smart phones application. The GPS and accelerometer team up to let you know what restaurants are available near by, even if they are not visible… along with a review of the product. Very cool… could be used as a as a tour application for the library… to find resources on and around campus. Evernote – An extension of your Brain. A universal capture application. On your desktop computer you can clip and store web pages, PDF files, images… anything digital. On your smart phone you can access all that captured information, plus you can capture images, audio, and type in text. Can take pictures of whiteboards and sheets of paper so you can have a digital copy. All the data is stored in the “could” and is synced to each of your devices: desktop computer, laptop, iPhone, iPad, Blackberry, Android Phone. An excellent tool for research and travel… Do research on your desktop, and access it anywhere! Kindle Reader – Not just the Kindle Reader. Read books across multiple devices: Kindle Reader, iPhone, iPad, Blackberry, Android. Highlight (& see what others have highlighted), annotate, bookmark. 4 Square – Check-in to locations (like the law library or McPherson)… win prizes at some businesses, and find out where your friends are hanging out. Stanford is using a 4 square like application for their graduation week. Entering students into draws if they check-in to at least two grad events. Alumni services and development are using the information from the program to keep in touch with alumni after they leave. Catalog Search w/ Integrated Library mapping. Links to mobile Databases we subscribe to. QR Codes on all handouts so students can go to the website for further information. What are Smart Phone Apps NOT Good for? ‹ Who knew that Lada Gaga was a Librarian! I’ve always preferred a small laptop rather than a smart phone. I just haven’t joined the ever growing band wagon lol.